Home › Latest News › H.O.G.® Party in Portorož, Slovenia. H.O.G.® Party in Portorož, Slovenia. In 1983 the Harley-Davidson Motor Company founded the Harley Owners Group® (H.O.G.®). An owners club like no other. Riders lined up in their thousands to join such an exclusive group. And it’s easy to see why. With a whole host of perks, exclusive events, and a team of like-minded people behind you every mile, life on a Harley® feels just so much better when you’re a H.O.G.® member. Within six years, the world’s first factory-sponsored motorcycle club had already attracted more than 90,000 members. Today, in 2016, there are around one million H.O.G.® members in more than 140 countries worldwide, and more than 110,000 in Europe, The Middle East and Africa alone. And it just keeps getting better and better. What else could you expect from the world’s greatest motor company? Only the world’s greatest owners club, of course. Life on a Harley motorcycle is so much better when you become a H.O.G.® member. The upcoming 25th Annual European H.O.G.® Rally in Portorož, Slovenia will take place between 16 and 19 of July. It is expected to become one of the biggest H.O.G.® events in Europe. The Rally is perfectly planned and has an excellent schedule where nothing had been skipped. 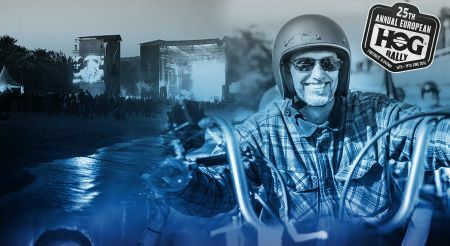 The 25th European H.O.G.® Rally programme is packed with great entertainment and things to see, from music on the main stage, the Custom Bike Show and Expo, to Demos, H.O.G.® Zone, Jeep® Zone and all the amenities of Portoroz and Piran. Take part in the spectacular Harley-Davidson parade. If you’re a registered representative of a Chapter, show your Chapter pride and get a place at the front of our spectacular parade. Secure yourself an event parade ribbon at H.O.G.® Information. Find out more in the H.O.G.® Zone. Come and find out about all the latest news and events at the H.O.G.® Zone. Register or renew your membership, or speak to one of our dedicated Member Service agents to really get the most out of life on a Harley-Davidson®. On the other hand, if you think you’ve got the best custom bike on the road, you could put it to the test. The Harley-Davidson® Custom Bike Shows attracts some of the world’s finest bike builders, across a number of different categories. Enter to win, or just marvel at the masterpieces. A little competition never hurt anybody. Register at the Custom Bike Show Area. Space is limited so arrive early for a chance to enter the show. Come and find out about all the latest news and events at the H.O.G.® Zone. Register or renew your membership, or speak to one of our dedicated Member Service agents to really get the most out of life on a Harley-Davidson®. It seems like the 25th Annual European H.O.G.® Rally will be full of surprises. For further details and up-to-date information follow the news on the website and and the posts on our Facebook page on https://www.facebook.com/harleydavidsonsofia/. Soon.